Borderless, a global leadership consulting and executive search firm, wanted to increase its thought leadership profile in the various markets it serves. The firm wanted to stand out as an industry leader within the highly competitive executive search and leadership consulting sector, and promote itself as an authority on the latest issues affecting the modern C-suite workplace. A longtime client, Borderless worked with Mach Media to execute a survey to be supported by an integrated public relations and social media campaign. 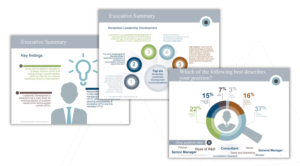 Mach Media created two PR campaigns: one based on a survey that gathered insights from respondents on what attributes a successful leader should possess; the other, a series of bylined articles on diversity and inclusion in the workplace authored by Rosalie Harrison, a Borderless international management consultant. Mach Media promoted the survey through Borderless’s client newsletter. 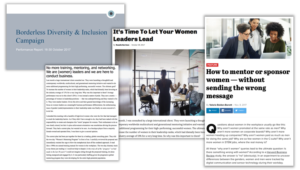 The bylined articles on enhanced diversity and gender inclusion in the workplace were promoted via its social media profiles on LinkedIn and Twitter. Mach Media also pitched both initiatives to international media outlets. The survey captured insights from close to 1,000 senior executives across a range of industries. Mach Media wrote a report based on the survey results, drafted a news release based on those results, constructed a customized journalist outreach list and executed a media outreach campaign to various print and digital media outlets. Placements included: CNBC Africa, Thought Leaders, PR Moment, People Management Magazine, and Zenger & Folkmann podcast. The high rate of response on the survey and depth of the feedback further provided critical intelligence to Borderless on the relevance of leadership development and its role as a key enabler of business strategy and growth. For the bylined diversity articles, Mach Media customized pitches for each article to specific media outlets and promoted the articles via Borderless’s LinkedIn page. The social media campaign garnered 200 unique visitors who viewed the article. The campaign also helped increase website traffic by 15%, with numerous visitor clicks coming directly from the LinkedIn posts when it was proactively shared by the Borderless team, a practice that helped raise visibility of Borderless content to a much broader network. Media placements of the bylined articles included: Chief Executive Magazine, People Management Magazine, HR Diveand RecruitingDaily. Since the initial public relations campaigns, Mach Media has planned two campaigns per year to maintain Borderless’s brand recognition and thought leadership. Each new campaign will entail Mach Media crafting all the materials, launching and analyzing the survey, following up with key survey respondents, drafting and posting social media content, executing media outreach through news releases, customized pitching and on-record interviews with key media outlets. Mach Media supports its clients through tailored services to best address their unique challenges. For more on our PR services check out our PR and Events page, or our general solutions page for more information on all our services, and contact us today!